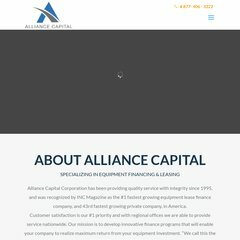 www.Alliancecap.com - . :: Alliance ::. Topics: Leasing Overview, Benefits Of Leasing, Types Of Leases, and Finance Programs. Alliancecap.com's IP address is 130.94.151.75. Its 2 nameservers are ns1.secure.net, and ns2.secure.net. PING (130.94.151.75) 56(84) bytes of data.